Spring sales are right around the corner! It’s not just pottery at this one, but a lot of different crafts. Come check it out! There’s tons of locations to stop by during the St. Paul Crawl, but the Schmidt Artist Lofts (old Schmidt Brewery buildings) have a lot of artists setting up so it should be high on your list. I’ll be selling out of my room alongside a great painter, Rosie Michelle. There’s a a lot of great potters here this year, the most we’ve ever had! 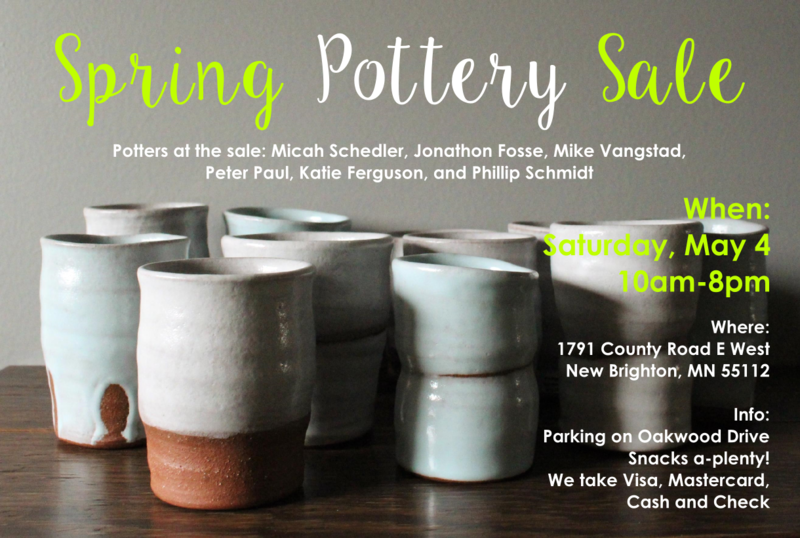 Etsy is also up and running, so go ahead and check out VangstadPottery on Etsy.com or just click on the “shop” link at the top of this page! I’m currently getting set up in a new studio in the Schmidt Artist Lofts. I’ll still be electric firing for the time being, but I’m working on some of my own glazes and some new ideas. There should be some new pots getting posted soon!